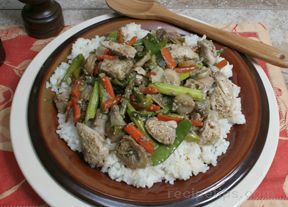 With a wonderful blend of distinctive flavors, this dish is an inventive take on traditional chicken casserole recipesâ€”and, because it is quick and easy to prepare, you can have a tasty meal in an hour or less. Brown sausage in skillet. Drain on paper towel, cut into bite size pieces. 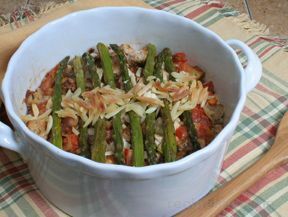 In baking dish, combine chicken, sausage, tomatoes, broth, onions, oregano, thyme, tobasco and parmesan cheese. 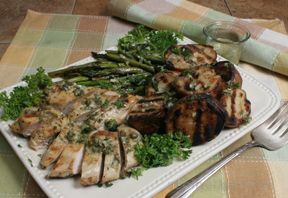 Trim asparagus and grill or steam for 3-5 minutes, just until crisp tender. Arrange asparagus in a row on top of casserole. Sprinkle almonds in row atop asparagus. Bake, covered, at 375° for 35 minutes or until hot and bubbly.